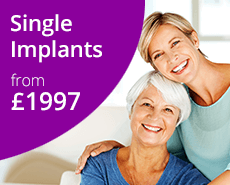 Dental implants in Grantham are a long-lasting solution to missing teeth that bring a wealth of aesthetic and dental health benefits. At the Dental Health Centre in Grantham, our highly-experienced implant dentists have helped many of our patients regain their smile (and their confidence) with dental implants. As specialists in the dental implant field, we provide several advanced treatments to help meet the needs of as many of our patients as possible. These include implant dentures, single implants, immediate implants and complete implant smile. We’ve detailed the different steps of the dental implant treatment process below. The process for immediate implants and complete implant smile is different which is why it’s listed separately below. At the Dental Health Centre, we take a personal and bespoke approach to all treatments which is why the steps are a general guideline. We’ll develop a unique treatment plan for you after your initial free dental implant consultation complete with timings and prices to help you make a fully informed decision. Generally, treatment takes 3 months with costs starting from £1,997 for a single implant to £9,000 for the complete implant smile. * To find out more about the benefits of tooth implants, please click here. Not everyone is suitable for tooth implant treatment so our specialist implant dentists will carry out a thorough check to see if it’s appropriate for you. 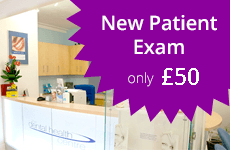 We’ll ask questions about your medical history and carry out a full examination of your mouth and teeth. We’ll also take some X-rays and models as well as carrying out a CT scan with our next-generation scanner to check if you have enough bone volume for tooth implants. If you’re suitable for treatment, we’ll work out the optimal position for an implant and how many tooth implants you will need. Successful implant treatment does depend on adequate bone volume – if you don’t have enough bone (but are suitable for treatment) we will need to graft or regenerate bone (this can be more likely for implant dentures). This will add to the length of your treatment time and costs. Guided bone regeneration (GBR) starts from £370 with block bone grafts and sinus grafts starting from £850 and £950 respectively. We will also extract any failing teeth at this point. Implant placement is a small surgical procedure that’s carried out under local anaesthetic. Tooth implants are made of 3 parts – a titanium screw/rod, a connecting part and a crown (the part that looks like a real tooth). During this stage, the screw is placed precisely into your jawbone. Tooth implants can take from 6 weeks to 6 months to fuse with your bone. When fusing is sufficient, we’ll fit the permanent crown, bridge or denture onto the implant. Crowns or bridges are created using the impressions of your teeth taken during the initial assessment to ensure a perfect match in shape, size and colour. Dental implants are brushed and flossed in the same way as your normal teeth. We’ll give lots of advice on how to clean. It’s also essential to attend all check-up and hygiene appointments. An early start – for complete implant smile, any remaining teeth are extracted under local anaesthetic before the implants are placed. We’ll take impressions of the tooth implants at this point. 2 to 3 hours later – while you relax, our technician has been making your temporary acrylic bridge or crown. We’ll carry out a trial fit after lunch. Late afternoon – after any necessary refinements and adjustments have been made, your temporary crown or bridge will be fitted and you’re free to go. Try to stick to softer foods during the first 2 months while the implants heal. We check you again in 8 to 10 days to make sure everything is healing as expected, remove any sutures and to check and adjust the bite. After 6 months – we’ll remove the temporary crown or bridge before taking new impressions and making the final crown/bridge. For more information about dental implants in Grantham or to discuss your circumstances, please contact us today! 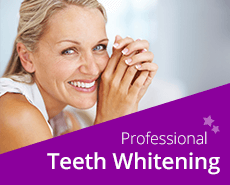 Call 01476 594480, email info@dentalhealthcentre.co.uk or complete our contact form.